There will be many occasions where we have to change the system of play to suit the moment. I want us to be able to play several different ways depending on the course of the game. 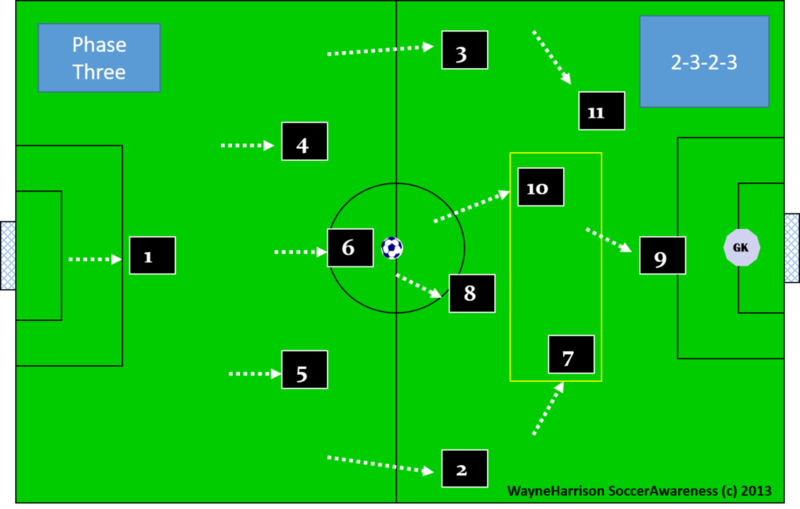 This is the attacking team shape (attacking “start position”) for a 4-2-3-1. 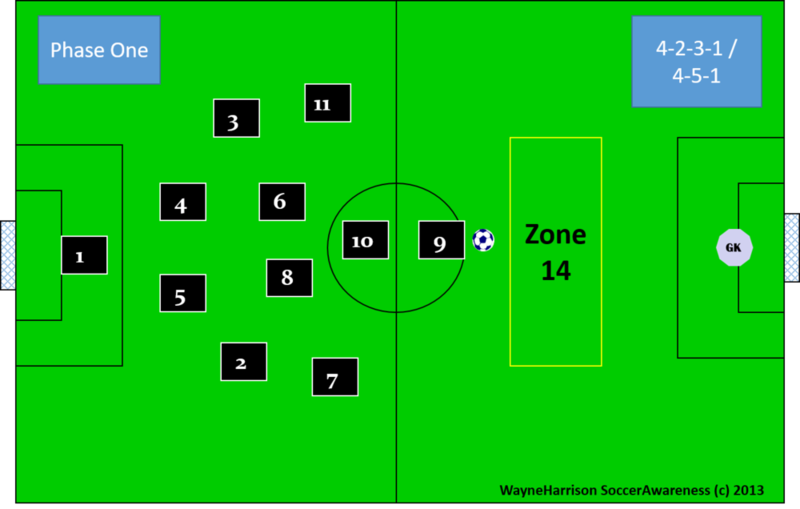 Zone 14 is the area between the opponents back three or four and their midfield. For U11, U12 and U13 to affect the minds of 7 and 11 we may call it a 4-2-1-3 so they think positive and in an attacking mode. This is the attacking team shape now a 2-3-2-3 or 3-1-3-3 depending on the moment. This can also be the attacking team shape we change to when we are chasing a game perhaps losing 1-0 and wanting to be more positive in attack. So this now would be the start position. A lot of interchanges between positions in attack. If we lose the ball we have to be tuned into being defensively concentrated and disciplined . If we cannot win the ball back quickly we can alternatively drop into a compact defensive unit. Perhaps (9) can try to delay the opponents attack until we get into our best defensive set up. Regaining Possession very close to THEIR goal so immediate high pressing as a team. A Full Team Press from back to front. We must press up from the back too leaving opponents offside; should they get a chance of a counter attack. First pressing player should stop the attempted forward pass. Defenders must decide in a split second which course of action they take. Get the rest of this presentation and much more like this in the Featured Presentations section of the Soccer Awareness Training Center. Not a member? Try for one week free!